I am delighted to offer you my contemporary novel, Leave it to Chance, available now for purchase. I am currently working on a two-book series. Sign up for my eNewsletter or Blog to receive advance notice of its publication. Single mom of three, Sierra Montgomery is desperate to find a new job to keep from having to move back home and be smothered to death by her mother’s good intentions and overbearing love. 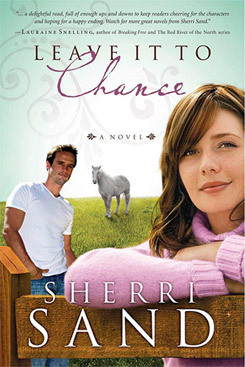 So when Sierra inherits Chance, a quirky old gelding she doesn’t have a clue what to do with, she thinks her best bet may be to sell the horse to cover another month’s rent -— a decision that devastates her children. Enter Ross Morgan, a handsome landscaper who just happens to have an empty barn and fenced pasture … perfect for an old horse to live out his days as the pet of three wounded kids. Ross develops a soft spot for eldest child Braden and he just might have one for Braden’s mother. But what he doesn’t have is time for distractions —— he’s got a landscaping business to run and nursery plants to tend. But Sierra has a secret. She’s terrified of horses and -— thanks to her past -— wary of attractive men. Yet seeing the way her angry son idolizes Ross and adores that old horse forces Sierra to confront her fears. Will she remain distrustful and self-reliant, or will she seek help from God and those who love her?